↑Vanguard S&P500 ETF went up by 4% or $2,226 for my portfolio. ↑ Gazprom shares went up by 7% or $8,586 for my portfolio. ↑ Company shares went up by 10% or $2,277. ↑ Rosneft shares went up by 22% or $2,449 for my portfolio. ↑ iShares core DAX wen up 7% or $1,442. ↑ Dividends Emerging markets sovereign bond (IEMB ) – $86 or 5% annually. ↓ Vanguard Emerging markets ETF is slightly down by 1% or $127. 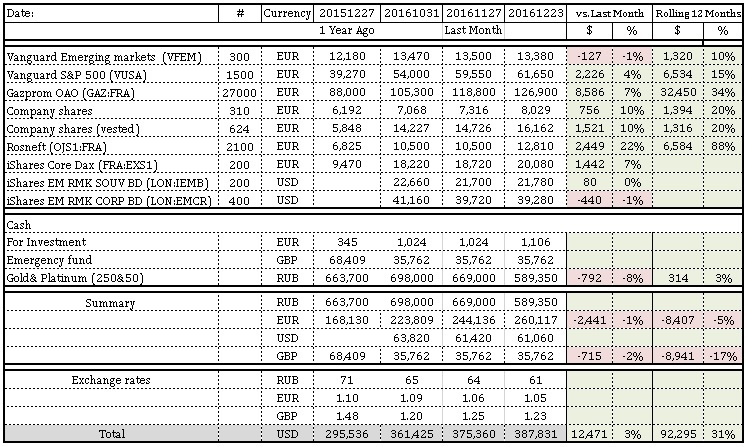 ↓GBP lost to USD 2%, for my portfolio it is $715. - With the wind change in the US the stock markets continue to grow in anticipation of pro-business and pragmatic leader in the oval office coming in power in January next year. For my portfolio it means that EU block currencies (EUR & GBP) are falling behind, with most of the loses are ($3,156) due to EUR and GBP fall to USD. I think that the USA economy will accelerate further in light of the proposed stimulus (infrastructure upgrades) and pro-business government (including anticipated tax cuts). - People are also pulling out from precious metals on expectations of USA federal interest rate raise. Strong dollar affects Emerging markets and EU, as dividends expected to be lower when converted to hard currency. However, if pragmatic relations will prevail between US and the rest of the world, than the emerging markets will prosper as well. - Even without end of the year dividends I have reached my annual goal of $8,000 a year. This is not a lot by any stretch of imagination and represents about 2% return (after taxes) on my portfolio – dividends only.